Tell me a little bit about The Wow Show. My character, EnzoClown, is an exuberant innocent who relies upon his own (admittedly limited) wits and the help of the audience to complete his list of tasks. 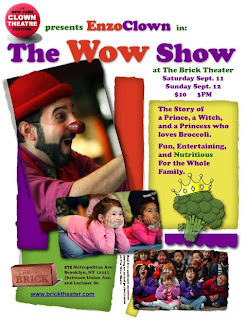 He enters the theater, explores his surroundings, and makes a mess of things as he tells the story of a Prince, a Witch, and a Princess who loves broccoli. The show is fun, entertaining, and nutritious for the whole family. The show was originally commissioned by the Aurora Theater, in Georgia, as part of their Learning Library series, fitting the state curriculum for early childhood education. Some of the basic skills expected of that age level (lists and following directions) were a good fit for a clown show (as any good subversive, clowns love to *try* to follow directions--with varying degrees of success). Creating a fairy tale--a hybridized Hansel-and-Gretel/Frog-Prince story--was another fun piece of the process that dovetailed with the curriculum. The end result is a fun, energetic introduction to live theatrical performance, that is entertaining for the entire family. What is your clowning background? Clown is an acting style. I'm an actor first; Clown happens to be one of my favorite means of creation and expression. Simply put, it's fun. It's one of those things where, looking back, it's an almost inescapable path that I've been on, starting with watching Abbott and Costello movies every Saturday morning, and an hour of Jackie Gleason every night when I was growing up. When my training as an actor began in earnest, I found that I kept encountering teachers who served as guides, mentors, and partners in Clown... and to this day, they just keep coming. 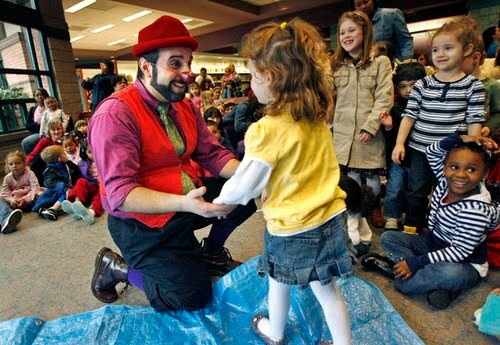 And, when I began working with the Big Apple Circus Clown Care program at Children's Healthcare of Atlanta (now preparing for our 10th anniversary in Atlanta), I found my artistic home. What would you tell someone who is afraid of clowns to get them to come see your show? For myself, I wear a very simple costume (ill-fitting clothes that seem to get ever-more-ill-fitting as the years go on), and a red nose. No make-up. My face and personality are plainly visible the entire time, and I consider it my job to make people more comfortable--not less. In performance, I only play with them that want to play with me. It's no fun otherwise. Let's face it: no one likes to have their boundaries or sense of space trod upon or disregarded. (May the gods forgive me for speaking in the masculine voice for convenience's sake) The Clown lives and thrives by his direct relationship with the audience. Professional performers of the caliber that the NY Clown Theatre Festival attracts, grok this basic tenet of performing artistry. Some random guy who buys a rainbow wig and a polyester jumpsuit: not so much. Along with various irons in various fires here at home, I'll be setting out around the new year to Dusseldorf and Geneva, teaching commedia dell'arte and puppetry, respectively.